Robertson Quay remains as one of my favorite food enclaves in Singapore. And so I had yet another great ladies night out there over the festive season. 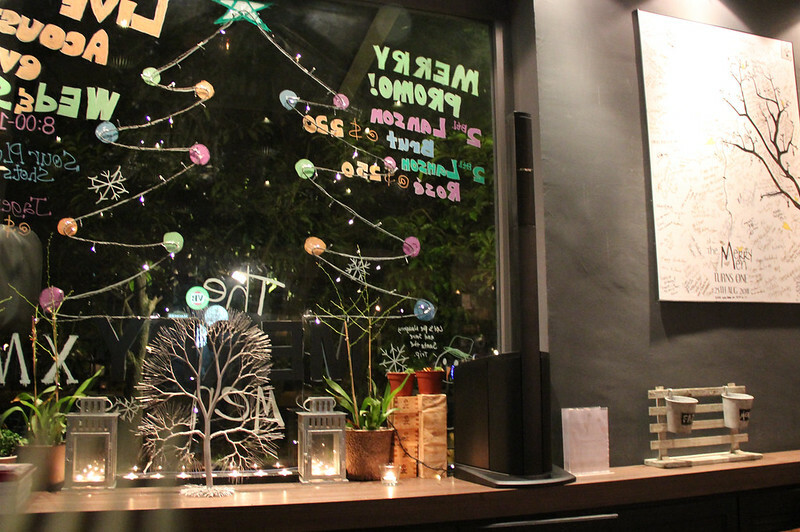 The Merry Men was chosen and I could see why it is easily one of a popular choice for a more casual yet ambient restaurant and watering hole. To my surprise, it’s interior is rather small with a couple of communal tables very suitable for large groups and just another couple of tables for smaller groups. Yet, a cosy, light-hearted mood seemed to befall on the place especially at night. (Definitely in love with their window panel.) But don’t worry, outdoor seating is available and not that bad too. As we dined in a large group that night we had the luxury of trying bits of pieces from every section of the menu. 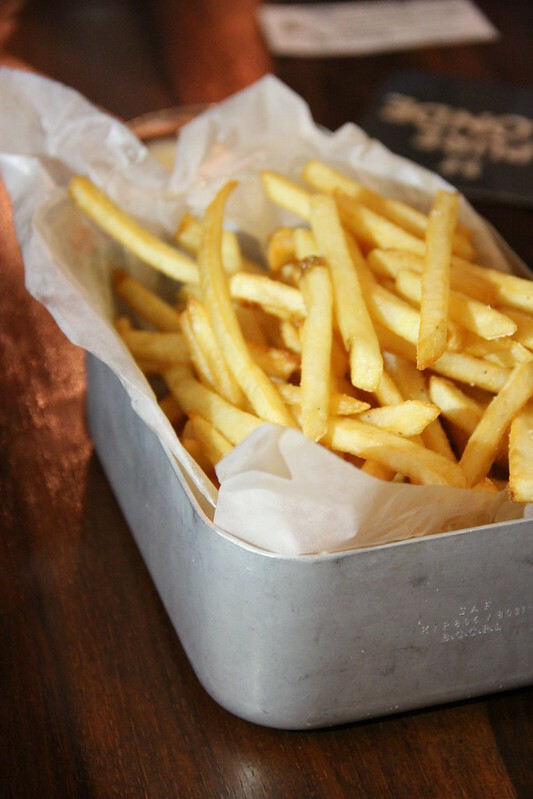 We started off with my all-time favorite Truffle Shoestring Fries ($10) which I always try to order whenever I spot it on a menu. I felt that the truffle oil wasn’t intense enough but there was an attempt to cover up by truffle-scented mayonnaise. Still, better ones out there! 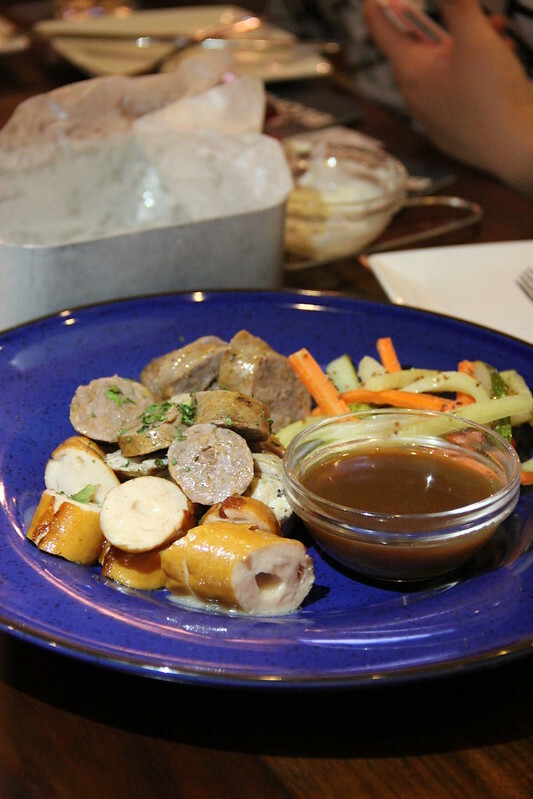 From their “Nibbles & Gobbles” we also had the Sausage Platter ($26) which mixed pork, beef and chicken sausages all together. We all agreed all of them were pretty good with some consistency. Moving on to their pastas, we had Penne Carbonara ($18) and Spaghetti Crabmeat Aglio Olio ($20). I preferred the later because it was more special in terms of its taste. It’s shredded crabmeat went rather well with the aglio olio. My only complain is the lack of garlic of chilli in the dish which could have turned tables around. The Bolognese Pizza ($20) felt plain and dry especially with the too generous heap of greens and tomato sauce which was light while the Roast Duck and Lychee Pizza ($20) won me over. 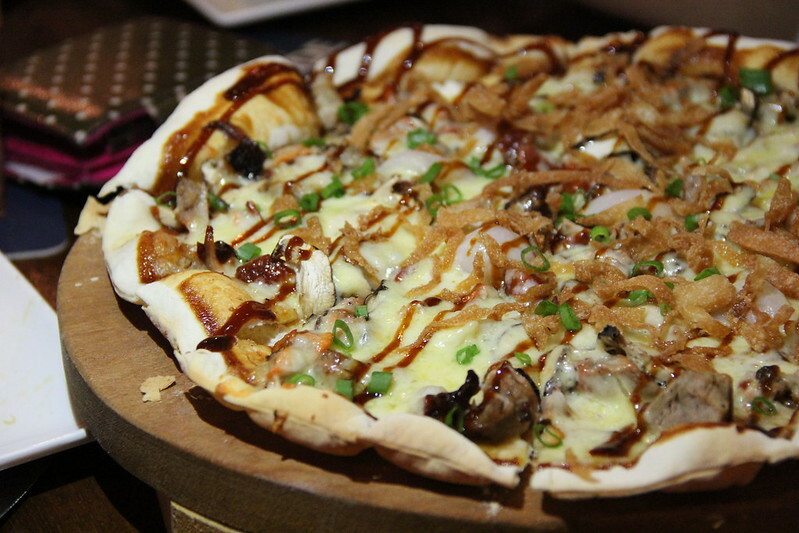 I’ve always marveled over the pairing of roast duck on crust and their rendition has surely not disappoint me. Hold on, we still have the mains to go. 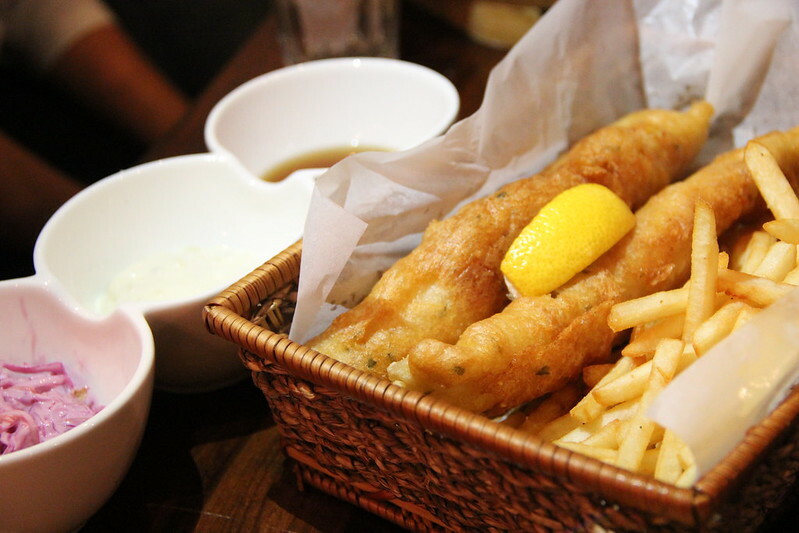 The Fish and Truffle Fries ($16) brought us back to another truffle state of mind except now with battered fish fillet and 3 sauces to dip and go along with. Not anything special but not any less disappointing as well. Same goes for the Yorkshire Pork Rack ($28), which had pretty tender char grilled pork meat, probably one of the better ones I’ve had. Yet it’s portion size really left me hungry for more. 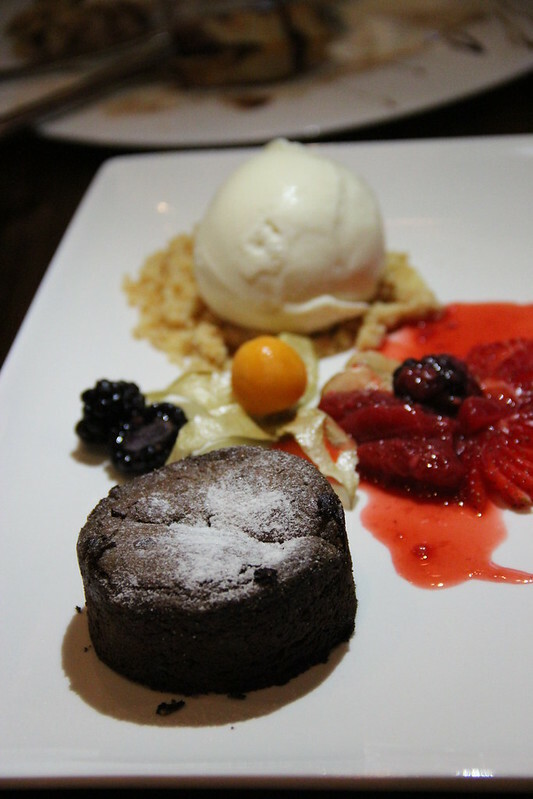 Of course, we can never call it a night till we have a proper ending with desserts. We opted for the Waffles ($12) and Chocolate Lava Cake ($14). The former was thick and good but a pity that it’s toppings were too creamy. Basically there were more whipped cream than chocolate, bananas and and ice-cream they were supposed to have. However the latter was a lot more satisfying with it’s thick, flowy chocolate popped molten hot into our mouths, accompanied by vanilla ice-cream afterwards. I guess I have mostly uncovered the ups and downs; hits and misses of The Merry Men. Quality of food is quite well done considering they function very much as a bar as well, but don’t be setting high standards. They do serve western food pretty well despite the several lacking points. Indeed, you leave as a merry man.